Account of the National Jubilee, in August, 1814; including a description of the edifices; the preparations, and exhibitions in the parks. Embellished with a view of the Chinese Pagoda, and the Temple of Concord. In 1812 the Gas Light & Coke Company received its charter thus ushering in a new era in both public and private lighting. Experimental street lighting had been established in 1807 but streets began to be lit in earnest when Westminster Bridge was thus lit in late 1813, followed by lighting in the parish of St Margaret’s, Westminster in April 1814. However, gas received its first truly spectacular exhibition at the visit in June 1814 of the Allied Sovereigns to celebrate peace and the abdication of Napoleon. To celebrate the visit a tall timber pagoda, 80 feet high and octagonal in form, was erected in St James’s Park. It was supplied with gas by the GLCC and each angle had a perforated gas pipe and burner, each gas jet igniting the next. 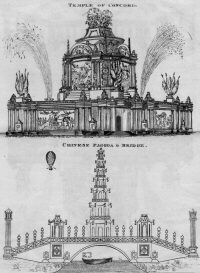 However, Sir William Congreve insisted on letting off fireworks from the pagoda before the gas could be lit and the whole structure burned to the ground. The episode entered the public imagination and the mythology of gas-lighting though the GLCC struggled financially for a few more years before the gas industry finally took off. An exceptionally rare item. 2 copies only listed on COPAC. 8vo. 17 + 1pp, 1 folding wood-engraved plate. Orig. printed wrappers bound in. Quarter cloth, marbled boards. Bookplate of Arthur Elton.